The previous towel animal blog was a dragon, which is one of the more difficult towel animals to make. It seems only fitting now to do a very easy dragonfly. Fold the bath towel in half across the short side. Fold over one corner on the open end. Roll towel from the folded corner. Making sure towel corner at the middle of the roll faces up, roll one end of the towel up, then flip towel over so rolled side is underneath. This style is more difficult to make, but it has a longer body in relation to the wings more like an actual dragonfly. Lay the bath towel out flat. 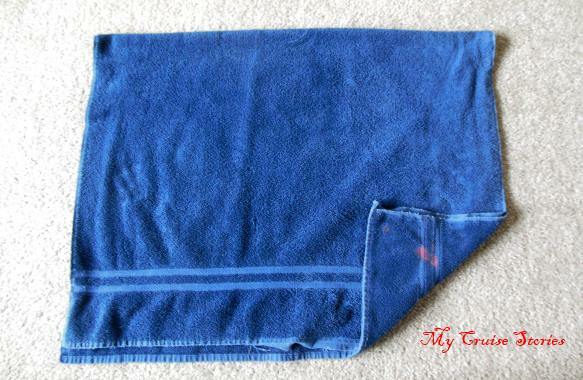 Fold down one quarter of the towel across short side. Fold down one corner of the folded end. Other than the initial fold to shorten the body a bit, this option of the dragonfly body is much like making my version of a towel snake. 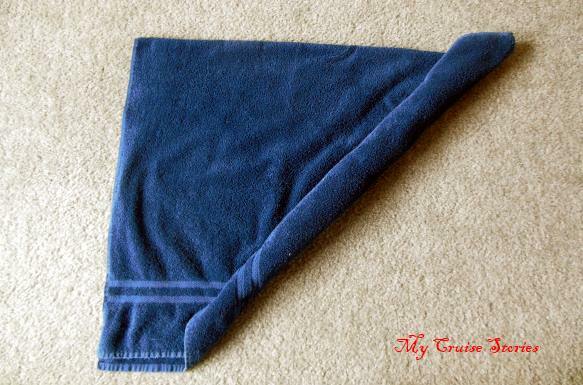 Fold both sides of the towel at the folded corner so it makes a pointy end with the point at the center of the folded corner. This will be one long side and one short side of the towel and the amount of folded towel will not be even. This doesn’t matter. The only important part is having a pointy end at the center of the folds. Start rolling from the far corner of the long side with the fold. Keep on rolling until the entire towel is rolled into one roll. Make sure the folds at the center of the pointy end stay flush. Set towel with folded side of pointy end down and pull opposite end tight for tail. Make wings near head end of body. Lay hand towel long side next to the body. Scrunch in the middle to make two wings. Repeat with other towel on other side. Adjust wings as desired. Decorate with eyes. Add antennae or other embellishments if desired. Use double stick tape to hold on eyes and antennae if necessary. Googly eyes work great, but if you don’t have them bits of felt or paper work for eyes too. I used a pipe cleaner (chenille stem) for the antennae (see top photo), but so long as there are no small children or animals that might get hurt on them things like pins with balls on the end or large colorful plastic needles would work too, with the bonus that they would hold themselves on and you could use one for each side. For more towel animal folding instructions please visit My Cruise Stories towel animal page where you just click the picture of the animal you want to make to get directions on how to fold it. This entry was posted in Towel Animals and tagged easy towel animals, how to fold towel animals, photos, towel animal folding instructions, towel dragonfly, video. Bookmark the permalink. The dragon fly looks harder to move around then most other towel animals. I guess it’s a good thing it’s easier to fold. The body is fairly mobile, but you have to re-do the wings if you move it. Thank you. I enjoy your blogs. They lighten up my responsibility filled life! You are an interesting and creative woman! When you go on a cruise, does room service provide a different whimsical towel creature every day? Unrelated: how’s your recovery going? Some ships have towel animals for everyone every day. Carnival, Holland America, and Norwegian always have them. On the Divina it depended on the stateroom steward. Ours didn’t know how, but he had a friend who did so we got a bunch of videos of him. The dragonfly is one of them, also the crocodile that I posted not too long ago. Unrelated: I’ve started strengthening exercises in physical therapy. It took me 2 weeks to work up to one pound on the weight so I guess that arm is pretty wimpy.